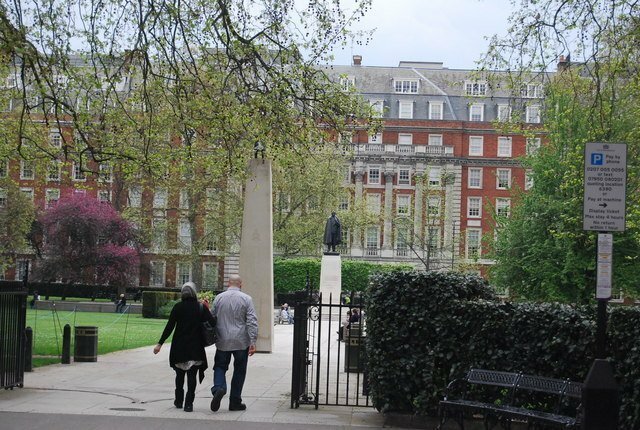 Grosvenor Square is the setting for the memorial to former US president Franklin Roosevelt and under the Roosevelt Memorial Act the British Secretary of State has the responsibility for maintaining it as a public garden. The square is also the centrepiece of the Mayfair property of the Duke of Westminster, and takes its name from the surname "Grosvenor". Grosvenor Square is the setting for the memorial to Franklin Roosevelt and under the Roosevelt Memorial Act the Secretary of State has the responsibility for maintaining it as a public garden. The square is also the centrepiece of the Duke of Westminster's property and takes its name from their family surname, "Grosvenor".